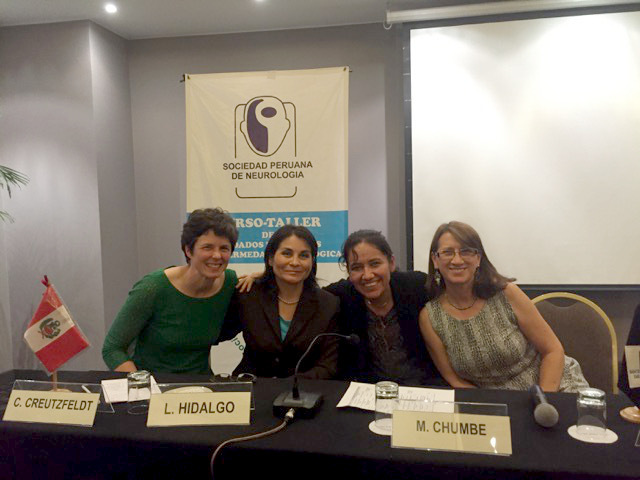 Dr. Claire Creutzfeldt (UW, left) joins Peruvian leaders in Palliative care: Dr. Pilar Mazzetti Soler, Dr. Lilian Hidalgo and Dr. Maria Chumbe. Of the 35 countries in Latin America, Peru is one of ten that have a national palliative care association(1). The World Health Organization developed a ranking of palliative care capacity across the globe and Peru falls into group 3: countries characterized by “the development of palliative care activism that is patchy in scope and not well supported; sourcing of funding that is often heavily donor dependent; limited availability of morphine; and a small number of hospice-palliative care services that are often home-based in nature and relatively limited to the size of the population”(2). Peru does not currently have a palliative care training program. On May 13-14 2016, the Peruvian Societies of Palliative Care (Sociedad Peruana de Cuidados Paliativos, SPCP) and Neurology (Sociedad Peruana de Neurologia, SPN) held their first two-day conference and workshop on “Palliative Care in Neurologic Disease” in Lima, Peru. Ninety Peruvian neurologists, neurointensivists, geriatricians, palliative care specialists, nurses, as well as some patients from the Peruvian national neurological institute (Instituto Nacional de Ciencias Neurologicas, INCN) gathered to learn about palliative care principles and the ethical considerations and challenges of neurological illness and disability. Invited political and healthcare leaders included: Pilar Mazzetti Soler, MD PhD, neurologist, former Peruvian Minister of Health, and president of the SPN and INCN; Lilian Hidalgo, MD, vice president of the SPCP; Maria Chumbe MD, neurointensivist at the INCN; Claire Creutzfeldt, MD, Assistant Professor of Neurology at the University of Washington. Dr. Creutzfeldt provided an overview of neuro-palliative care and ran a VitalTalk communication workshop (www.vitaltalk.org) to provide an initial framework for approaching discussions regarding serious illnesses. These leaders served as panelists in a roundtable discussion entitled “Visions for Neuro-palliative Care in Peru”, where they fielded questions and debated the next steps to facilitate the growth of neuro-palliative care in Peru. Specific aspirational goals emerging from the conference included: (1) incorporation of palliative care specialists into clinical neurology ward teams; (2) development of home health and hospice programs; and (3) integration of palliative care training into medical school and residency curricula. The conference was co-organized by NIH Fogarty Global Health Scholar Anastasia Vishnevetsky, MDc from the Perelman School of Medicine at the University of Pennsylvania, and Peruvian Geriatrician Carla Zapata del Mar, MD. The Peruvian Society of Neurology and the Peruvian Society of Palliative Care co-hosted the event. Additional support was provided by the NIH Fogarty Global Health Fellows Program (R25TW009345, awarded to Drs. Joseph Zunt, Chandy John, Joseph Kolars and Vivek Nerurkar) and the Fogarty Interdisciplinary Cerebrovascular Diseases Training Program in South America (ICTuS) Grant (5D43TW009137, awarded to Drs. Joseph Zunt, Hugo Garcia and David Tirschwell). Special thanks to Drs. Juan Luis Cam, Mario Cornejo-Olivas and Miriam Cuba for their help and support with the conference organization. 1. Asociacion Latinoamericana de Cuidados Paliativos (ALCP). http://www.cuidadospaliativos.org. Accessed May 19, 2016. 2. WHO. World Health Organization. Global Atlas of Palliative Care at the End of Life. http://www.who.int/nmh/Global_Atlas_of_Palliative_Care.pdf. Accessed May 19, 2016, 2016.